Audacious music player is a powerful lightweight player that runs on both windows and Linus based OS. its an open source player that plays your music how you want it without interfering in other tasks on your system. This powerful application is a descendant of a the popular XMMS and Beep media player software compatible on both GNU/Linux, BSD, and Microsoft windows. The new version of this program was recently released at the end of February and available for download. Audacious 3.6 boast of the new Qt-based user interface. This Qt 5 based UI can be installed alongside the existing GTK+ and Winamp Classic interfaces. But is not yet as feature-rich as the existing interfaces, it will be the basis of a Mac OS X port of Audacious. This post, however, will center on Linux Based Audacious. 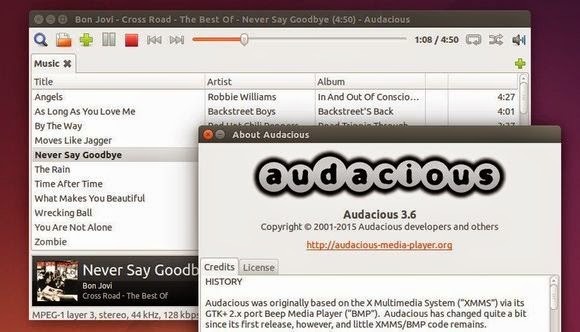 In this tutorial, am going to show you how you can install the new version of Audacious (v 3.6) on Your Ubuntu OS. by default, Audacious 3.6 switches back to GTK2. However, you can still built it with GTK3 if desired, but GTK2 is recommended for any desktop environment other than GNOME 3. Source code now converted from C99 to C++11. Audacious can now be built as a headless music player “daemon” with no GTK+ dependency. Sort your playlist by genre. A new “Open Containing Folder” command has been added to the GTK+ interface. new effect plugin to remove leading and trailing silence in any song file. Support for the SID song lengths database has been restored. First, open terminal from the Dash/Menu. You can also use the following key combinations to open terminal (Ctrl+Alt+T) on keyboard. Now follow and type the below commands one by one to add PPA, update system cache, and install/upgrade Audacious. If you typed the above commands correctly, then you are done!